1. Prepare pasta according to package directions; drain. Preheat oven to 375°F. 2. In a large bowl, combine pizza sauce, garlic powder and onion powder. 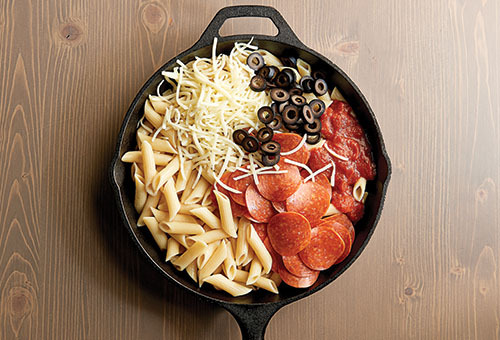 Stir in cooked pasta, pepperoni, olives and 1 cup mozzarella cheese. 3. 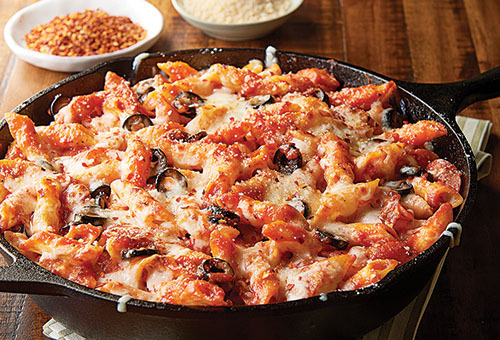 Spoon into a deep, round 8-inch baking pan. Top with remaining cheese. 4. Bake, uncovered 15 minutes, or until heated through. Serve with crushed red pepper flakes and grated Parmesan cheese, if desired.